Available now! I had a sneak peek from Net Galley and Simon and Schuster; thank you twice, to both of them. Reblogging this for Memorial Day. Gwynne describes his biography of Jackson as an amateur effort, and as such, it is a strong one. He documents meticulously, using both primary documents and highly respected secondary sources. It is a sympathetic portrait of Jackson, generally speaking, although the author maintains a reasonable professional distance and objectivity. Sometimes his point of view is that of the dispassionate observer, and at other times, he speaks as if he were Jackson’s friend, a quirky touch that I found oddly endearing. Although I have read a good deal about the American Civil War (and taught about it), I have never read a Jackson biography before, so I don’t have a basis for comparison. This is a bare spot in my own Civil War scholarship that I hope to rectify. I encountered one obstacle in reading this otherwise well written work, and also what I believe is a flaw. The obstacle–and it’s happened more than once and is no fault of Gwynne’s–is that history can’t be read really well on an e-reader. Elaborate battle plans are described, and then this teeny weeny map pops up. Even if I had been able to use the zoom feature (which on a galley is not offered), I still would have needed to see the whole picture at once to really understand what he did. If you are a reader who is satisfied to know that he did something unconventional and brilliant, this may not bother you, but much of the biography is devoted to specific military tactics, since it is primarily this that brought Jackson his fame. It only whetted my curiosity, and in one way or another, I will follow up at a later time and get maps of those battles on paper in a readable size. If you feel the same, and if you get this book, I strongly advise you to buy the hard cover edition rather than e-reader or audiobook (unless it goes to paperback, which would be both useful and more affordable). The other thing that bothered me is that Gwynne tries to do too much. The first twenty percent or so goes off onto unnecessary tangents, trying to provide us with a thumbnail version of the entire Civil War from its inception to the time of Jackson’s death. 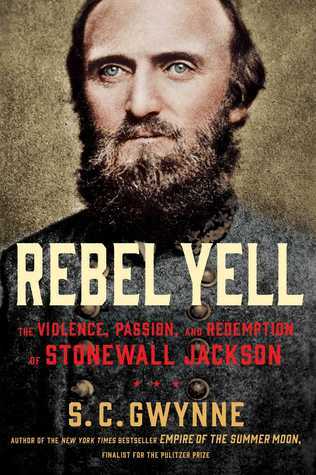 This is both off topic, since the book is a biography, not a Civil War history, and of course also an inadequate history. At the end of the book he does the same thing, trying to thumbnail sketch the ultimate fate of every player in the parts of war in which Jackson participated, and some others also. On the one hand, maybe this makes it more approachable to someone unfamiliar with the Civil War, but really nobody should plunge into a biography of a Civil War general without first becoming familiar with the basic facts of the war. I would have preferred he consider the basic outline of the Civil War to be assumed knowledge, and move forward, focusing exclusively on Jackson and whatever other information is necessary to set context. I felt he did well in his detailed sketch of Jackson. His religion was an integral part of his personality, and though I am an Atheist, I have known others who have had the same capacity to carry their faith into everything they do. They don’t remind others constantly to give God the credit for whatever achievements bring them praise, but this is a different time; the period just after the Industrial Revolution saw a much wider and more visible Christianity throughout the US. Others were assumed to be Christians unless they went out of their way to say otherwise. Therefore I agree with Gwynne’s assessment that Jackson’s religious behavior was not a sign of mental illness, but merely a personal trait distinguished by its consistency. Like other heroes of the Civil War such as Sherman and Grant (my own favorites), Jackson was not successful until the war broke out. He grew up poor and by his own determination succeeded in procuring a military education, which was tuition free. Afterward he became a teacher, but was by all accounts just dreadful. His delivery was mumbled and unenthusiastic, his discipline harsh even for the time, and his instruction consisted of assigning students to memorize passages of the text without his first explaining the meaning of the text or offering a chance for students to ask questions. Students called him “Tom Fool” behind his back and made fun of him in his presence. The war transformed him, and somehow when it came to training soldiers, he was a wonderful teacher. Anyone who did not seem to understand what to do was drawn aside by Jackson and given one-on-one training. He wanted to invade the Northern states right away, under a black flag (so shoot everyone and take no prisoners). He found this entirely consistent with his religion, since like so many warriors before and after, he was persuaded that God was on his side. His most famous quote, perhaps, is to the affect that it is good that war is so terrible lest we grow to love it too much. By all accounts, it lit him afire, with a light in his eyes that occurred at no other time. In modern times, he’d be known as an adrenaline junky, I suspect. His men at first despised him for his long, forced marches through all kinds of terrible weather and terrain, but it was victory that made them love him. Most of them were young, and what better way to march into manhood than a structured situation in which one is guided in his actions, and meets with nearly immediate success? The battles were traumatic, to be sure, but given the circumstances, they would have been drawn into battle, one way or the other. Under Jackson they found an unassuming leader who took no luxuries for himself and didn’t ask his men to do anything that he himself would not do. He became the ultimate father figure for many. His campaign in the Shenandoah Valley made him famous; his successes at both battles at Manasses (Bull Run), the 7 Days battle in the Wilderness, and others too numerous to list–in fact, I was surprised how many, since I had come to regard Jackson as a star who had shown brightly but briefly–made him a hero even Union soldiers would cheer, and the Confederate news source that claimed that “Stonewall” would become as much a legend as “Old Hickory” (Andrew Jackson) actually understated what posterity would hold for this humble man. His fearlessness was due to his absolute and utter conviction that God had sent him on a mission, and nothing could happen to him until God was satisfied that his purpose had been fulfilled. This gives me pause. At what point does one draw the line? He didn’t do anything clearly foolhardy such as jumping into raging rivers or leaping off cliffs, and yet he thought nothing of exposing himself to a hail of bullets near the front of the battle, convinced that he was covered by a magical shield provided by an omnipotent God. Again, I don’t say he was crazy, but it makes me curious. This is one character for whom I’d love to go back in time and have a conversation. Gwynne’s writing style is lively, his transitions smooth as butter. Another book of his, which I’d like to read, was a finalist for the Pulitzer, and that word-smithery is evident here also. He turns a compelling narrative that at times may make one forget that this is nonfiction, not unlike The Guns of August (by Barbara Tuchman). If he were to refine his format to a more laser-like focus on Jackson, maybe he’ll be nominated again; hell, maybe he will anyway. A wonderful read; get it in paper format!